Every young girl wants to look lovely at Christmas. But that doesn’t have to mean putting on a typical Sunday-best dress – that can be kept for another occasion, while for Christmas an original Miss Santa dress can be worn! We have a truly special Miss Santa suit for girls, comprising a beautiful high-waist dress and hairband with a bow. 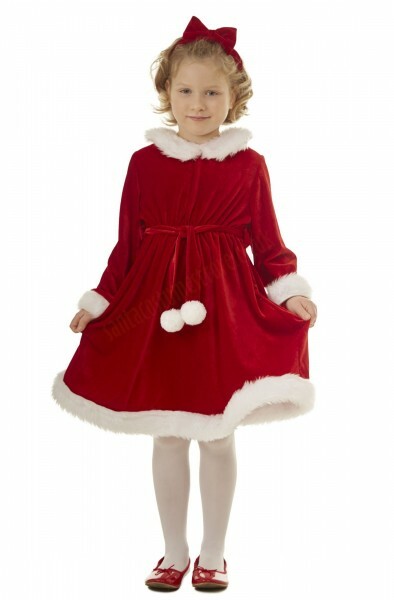 Our Miss Santa dress is made of red velour, and trimmed with a band of white faux fur that’s nice to the touch. The velour belt ending in two little pompons makes a charming addition to the dress. There’s a red velour hairband, featuring a red bow, for adorning the girl’s hair – a perfect complement to the Miss Santa costume for girls. As a whole – an extremely pretty and at the same time very smart set! 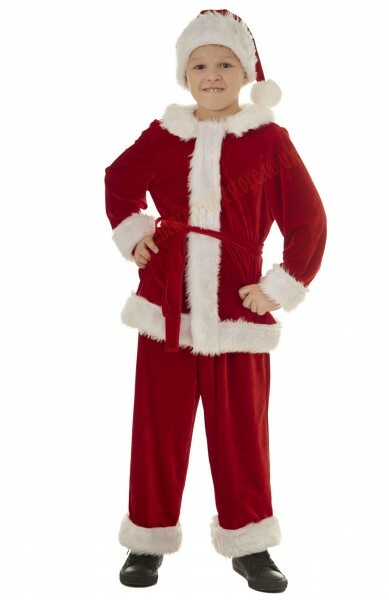 This Miss Santa suit for girls is available in 4 sizes: 3-4, 5-6, 7-9 and 10-12. The perfect costume for a young girl keen on helping out Father Christmas! NB – the costume does not include the shoes or tights shown in the photos.